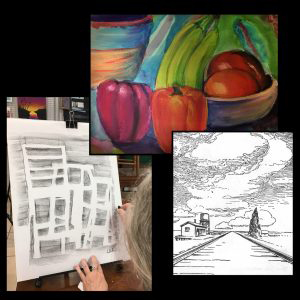 The Studios of Cocoa Beach, 165 Minuteman Causeway in downtown Cocoa Beach resumes it popular Open Studio: Drawing and Painting Workshop to be held every Wednesday from 6 to 8 pm. This on going class meets weekly and covers a variety of art techniques with a new project weekly. Artist and experienced teacher Jaymee Weinreich will cover drawing, color theory, painting techniques and a variety of art media. Cost of the class is $20 per session. The workshop, for beginning and intermediate students, meets every Wednesday from February 28 through April 4. You need not be there weekly as each evening is a self-contained lesson. Registration is required. Contact Jaymee at jaymeeweinreich@yahoo.com or 787-640-6119 (text or call) to sign up and get the supply list for each week.